I stumbled upon this Scottie Dog pattern on a website called Womenfolk.com a few years ago. I love this version of a Scottie because the proportions are nice and the fact that I can turn it on point is a fun extra! When I posted a picture of this Scottie on Instagram the other day, I had several folks asking for a tutorial. So here you go! The first thing to do is to print the Paper Pieced Scottie from the website. There is another set of templates for piecing with templates. For our purposes we will use the foundation paper pieced version. Foundation paper piecing is stitching right through the paper...so you will want to discard your sewing machine needle after you are finished or at least set it aside and reserve it only for stitching through paper. This is a 9 inch block...be sure to copy at 100%. Now, let's gather the other supplies you will need. You will need the pattern fabric scissors, paper scissors, rotary, ruler and a postcard or rewards card to use in folding. It's also very useful to have some type of fabric glue. I will use Roxanne's Glue Baste-It. Reduce the stitch length on your machine to about 1.5. This is necessary to perforate the paper so it is easy to tear away after the block is complete. Also the reduced stitch allows you to tear off the paper without pulling the stitches out. Of course, you also need fabric! Foundation paper piecing is a tad wasteful with fabric because you are over-sizing the fabric pieces and cutting back to size. As you become more proficient there is less waste. But for those of you that are using this method for the first time, I would give yourself a little more wiggle room and cut your pieces a bit larger as you go. I cut my pieces for each section as I need them...not before sewing. The key point to remember when cutting your fabric for each section, is to cut it AT LEAST 1/4 INCH LARGER ON EACH SIDE THAN THE SECTION. You will be trimming back as you sew and you need that 1/4 inch for the seam allowance. This is an easy pattern to foundation paper piece, but in the future if you have a pattern with a sharp angle, you will need to cut your piece quite a bit larger to accommodate the angle. Take the A section of your pattern and place a small dot of glue on the wrong side of the sub-section marked A 1. A1 takes a background piece. Cut your piece at least a 1/4 inch larger on each side than the pattern. You don't need to cut it carefully, I would just try to remember to keep the straight of grain parallel with the straight edges. The wrong side of your background fabric will be placed to the wrong side of the pattern. Notice my fabric is larger than sub-section A1. 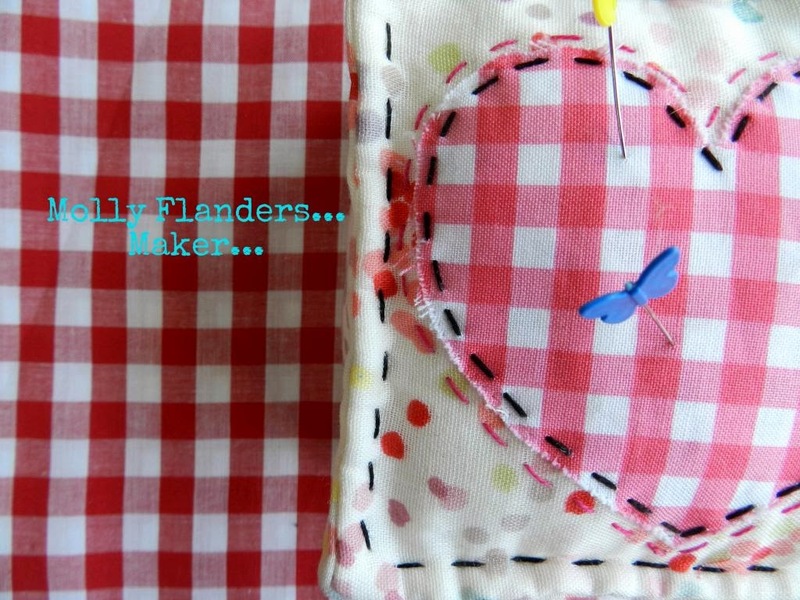 Flip the pattern, with the fabric glued to section A1, over and using your card, fold on the line between A1 and A2. The card helps make sure you are folding on the line because you will not be able to see this line. I am folding back on the line between A1 and A2. My fabric is completely covering section A1 and I still have at least 1/4 inch extra seam allowance on each side of section A1. Place your ruler so that the edge of the folded paper is hitting the 1/4" mark on your ruler. You will cut along this line, leaving a 1/4 inch seam allowance. Now take the fabric that will cover sub-section A2 (remember it needs to be larger than A2). Place that fabric with right sides facing on top of fabric A1. Be sure the right sides are facing!!! Also, be sure that the fabric is situated so it will completely cover A2 and leave 1/4 inch more on each side. If you can't see A2...hold the pieces up to a light or window and you will be able to see where this fabric needs to hit. Go to the sewing machine and stitch on the line between A1 and A2. Flip the pattern over and press these two pieces open. Then place your card on the line between A1, A2 and A3, again, fold. You will notice the extra fabric from A1 and A2 extending beyond that line. Place your ruler on the fold be A1, A2 and A3 and trim, leaving 1/4 inch seam allowance. Press back the fabric, fold, again between A3 and A4, trim seam allowance. Cut fabric for A4, sew on the line between A3 and A4, press A4 back. And repeat for A5!!! When you have finished an entire section, flip the pattern over and trim on the dotted line. This pattern has included the outer most seam allowance. If you come across a pattern that does not include the outer seam allowance you must leave a quarter inch on the outside of the pattern. Continue in this manner for the B and C sections of the pattern. When you get to the D section there is no sewing involved. But I place several dabs of glue to hold the fabric to this larger section. Then trim around the template. Now you are ready to sew all of the sections together. A to B, AB to C, and ABC to D.
You may want to place a little bit of glue along the seam allowance before you stitch the sections together to keep the fabric from shifting with the paper. After all sections are sewn together....give it a good press and carefully remove the paper. It is a good idea to place your finger over the stitches in your seams as you remove the paper....just to be sure you don't rip out the stitches. There you have it! A paper pieced Scottie! Cute Scotty Dog! Is he your next dog? I love foundation paper piecing. ohhhh! what??? hehehe! That works, too. The math is already done by that point, right? A Few Other Fun Makes!